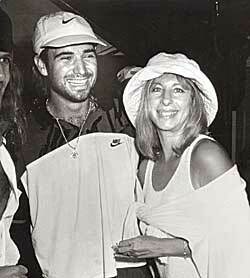 Tennis players have always gotten hot chicks (well, except for when Andre Aggs was dating Yentl - but he was on meth). Johnny Mac got Tatum O'Neal (she was on heroin), Jimmy Connors got Chrissy Evert (Ortho Tri-cyclen) and Andy Roddick got Brooklyn Decker (xenedrine, orlistat and Slim Fast). 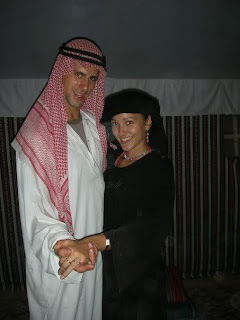 And now, Novak Djokovic (Flowbee) has topped them all, dating Jelena Ristic, who might just be THE HOTTEST. Jelena is so ridiculously beautiful that my wife legitimately got angry at me while watching Monday's US Open Final because I wouldn't stop begging to the CBS cameramen, "Please pan to that lady, please pan to that lady." Now, my wife could've just been mad at me because for the last 17 days running I've left my belt on the living room floor*, or possibly because I forgot to take out the recycling that morning, or more likely because I haven't been able to satisfy her sexually for the last 6 years, but the bottom line was that she was NOT happy with my feelings towards this week's Wednesday Wifey. * This used to say "living room foor", not floor, until loyal reader and person who likes to correct people, Gabulous, pointed out my typo. Thanks Gab aka Mrs. I Never Make Typos I Only Make Mills. Amazingly, there is VERY LITTLE dirt about Jelena online (she doesn't even have a Wikipedia page! ), so let's take a look at her through the lens of Google images and see if she's just as perfect as she seems. Okay, yep, still perfect. I mean, she's stunning, right? Check out how her blue sunglasses even match her dress AND the stadium seats. I guess maybe, maybe, you could give her minus points for that dumb hat, but I kinda like it! And we're still batting a thousand. Geez, how does this woman not have a Wikipedia page? I'm seriously contemplating making a Wiki page just for her wrist. You gotta admit, that's a nice wrist! If I were Novak, I'd hunt down whoever that guy to her right is that she's making oogly eyes to and overhand smash him in the face. Okay, finally, the first chink in her armor: a stupid fluffy dog. Also, she's totally hamming it up for the cameras which could mean that she likes Novak's fame a littttttle too much. That guy is really focused by the way - so determined to eat that banana! At first glance, this seems like a perfectly normal picture of the #1 ranked tennis player in the world giving a piggy back to his ridiculously hot Bosnian girlfriend ... but why does she have goggles wrapped around her left elbow? Who over the age of 7 wears goggles? This is kinda strange, right? For the record, I actually think goggles are amazing and every time I go swimming I wish I had a pair. I also wish someone would give me a piggy back ride. Those are fun! 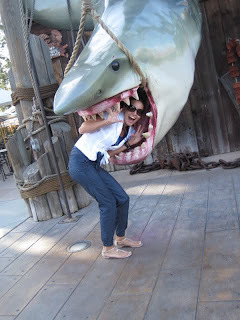 All right, now I understand why this lady has goggles - she can't swim! Either that or Novak is working on some sort of revolutionary Bosnian weight lifting program. Also, Jelena is sprawled out in the EXACT SAME position that I get myself into when I'm trying to please my wife. I call it Downward Frog. Oh boy, she's drowning. Like, she's actually drowning. And still, even though she's literally seconds away from death, her shoulder looks so hot and so smooth. And how 'bout that Bosnian flutter foot? Now Novak's just rubbing it in! Get over yourself Djokovic! Not everyone is blessed with both devastating groundstrokes and the ability stay afloat in water! Well that explains her fear of the water. Where the freak was Novak on this one? Are they playing miniature golf? They don't play miniature golf, they play croquet! ... Europeans! Now that's European. Pretty sure this is gonna end up being my wife's desktop wallpaper. Oh now the dog's in the water?!?! C'mon you guys! You're better than that! What's wrong with these two? Advantage: Roddick! Actually, is that even racist? I honestly have no idea what's racist and what's not these days. TVMWW has 96 95 followers on Twitter. NINETY-SIX NINETY-FIVE. (I lost one since I posted this Wednesday afternoon.) Help me get to a hundo back to 96! Or watch this video of an Italian football announcer going bonkers. It's FANTASTIC. More importantly, what's a living room foor? If I had one, I'd probably mind it less if socks & belts went there, instead of on the more commonly known — floor. Thanks typo police ... WHERE'S MY NEW HEADER?!?! ... TRUE BLOOD'S BEEN OVER FOR ALMOST A WEEK! True Blood is never over! And I've never really been a fan of Djokovich, except when he does impressions of other tennis players, until that speedo picture. And I'm being! !